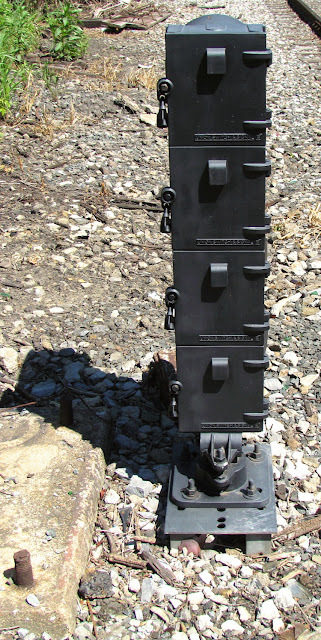 By the time the 1980's rolled around the dominant signaling providers in North America, US&S and GRS, were facing unanticipated competition from a variety of upstarts like SafeTran, Harris and others, that were making the incumbents 1920's vintage cast iron product line look a little long in the tooth. The result were a pair of odd designs that entered the stage and then quickly exited with nobody really talking about them ever again. The interesting thing is that both major manufacturers seemed to take the opposite lesson and in the end they both learned different things. 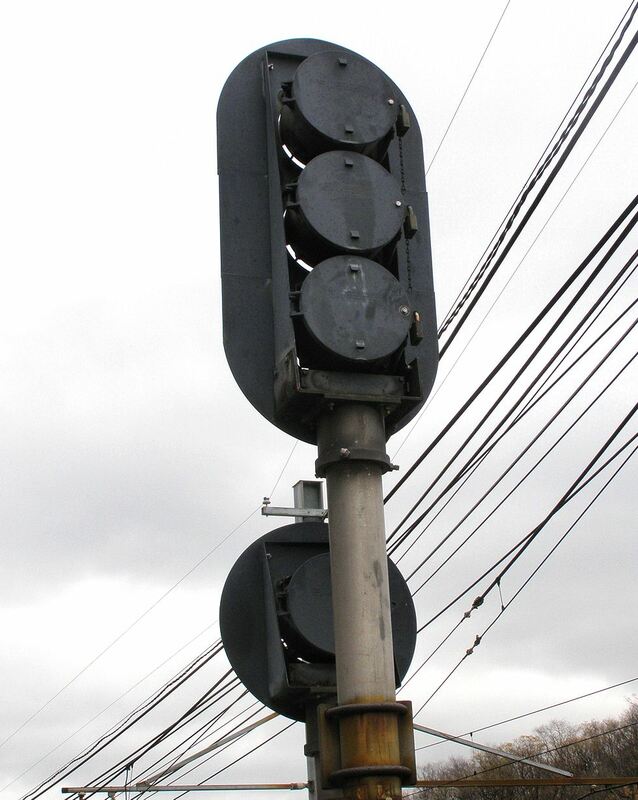 First up we have General Railway Signal's three lamp traffic light style signal. Previously GRS has been the leader in modular signal design with their Type D signal having one lamp and the ability to be stacked as high as needed. Seeing US&S with its successful 'N' series of linear multi-lamp signals, GRS added this rather low cost clone to its lineup. Can you can see from the photos it was very low frills except for a snazzy block style GRS logo on the back. The only nod to progress appears to be rust resistant aluminum construction. These signals are quite rare with the only notable installation being the LA Union Passenger Terminal and this attests to their general success in the market. It seems that GRS was stung by this turn of events as they basically exited the market for signal hardware aside from long running line of rapid transit signals that continue to be sold under the Alstom brand. As I said before, US&S took the opposite lesson and decided to add a modular signal to its lineup to supplement the N series that was forced to use a round marker lamp for single light situations. What they came up with is best described as...bizarre. Yes they thought the best solution for a stackable modular signal lamp was a round housing. Stacking support was provided by an external frame that came in 1, 2, 3 and 4 lamp configurations. Still, you have to give US&S a point for versatility since these units could also be arranged on a circular target signal in a 3 lamp configurations. Again note the Plain Jane construction which was common in the high labor cost/pre-CNC period. Needless to say these were also a flop with the largest concentrations appearing on the Pittsburgh Light Rail network and on the METRA Electric Division. However, unlike GRS, US&S chose to keep fighting the low cost upstarts and re-designed their modular signal to be the squarest square you have ever seen. Anyway, if anyone knows the actual model designations of these signals please let me know and I'll update the posts. Also, I assume that the design and market life of these signals probably went beyond the 80's on one side or the other, but that would make less of a compelling title. 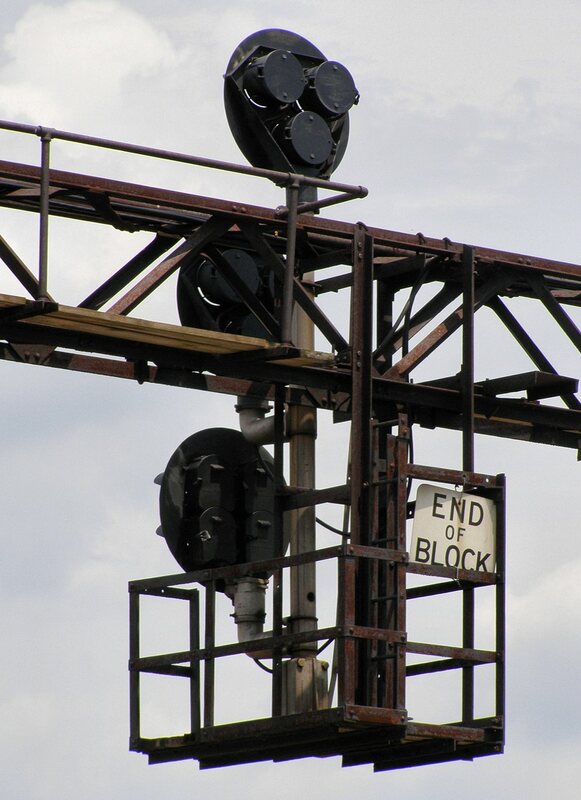 The N&W installed those US&S "modular" round housing signals between Fort Wayne and Muncie in 1982. They are the vertical frame type. They are about to fall thanks to the ongoing PTC project. FEC has a few of those GRS 3 lights still running around. My personal favorite installation is at Jupiter Bridge. On both sides of the drawbridge, the top signal head is GRS and the bottom 2 heads are Safetran. You should come visit the FEC sometime, before the double tracking project destroys all of the old searchlights and colorlights.